With DDR3 reaching its limits in a world that demands higher performance and increased bandwidth, a new generation of DDR SDRAM has arrived. DDR4 delivers higher performance, higher DIMM capacities, improved data integrity and lower power consumption. 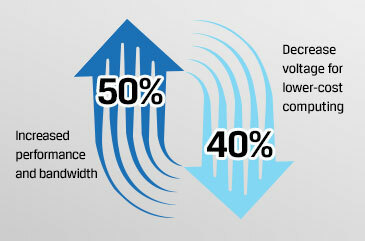 Achieving more than 2Gbps per pin and consuming less power than DDR3L (DDR3 Low Voltage), DDR4 provides up to 50 percent increased performance and bandwidth while decreasing the power consumption of your overall computing environment. This represents a significant improvement over previous memory technologies and a power savings up to 40 percent. In addition to optimized performance and greener, low-cost computing, DDR4 also provides cyclic redundancy checks (CRC) for improved data reliability, on-chip parity detection for integrity verification of ‘command and address’ transfers over a link, enhanced signal integrity and other robust RAS features. Please note that there are subtle differences between DDR3 and DDR4 modules. The key notch on a DDR4 module is in a different location from the key notch on a DDR3 module. Both notches are located on the insertion edge but the notch location on the DDR4 is slightly different, to prevent it the module from being installed into an incompatible board or platform. DDR4 modules are slightly thicker than DDR3, to accommodate more signal layers. DDR4 modules feature a curved edge to help with insertion and alleviate stress on the PCB during memory installation.